KOKOMO, Ind. – In a story published in the Sports Journal in 2016, Jimmy Rayl explained that the second of his famed 56-point scoring games at IU almost did not happen. He told the story while sitting in his living room with the actual basketball on a shelf above his head. … about that 56-point basketball in his living room – he actually had two 56-point games while playing for the Hoosiers, and both are still the single-game scoring record at IU. The amazing part is he did it without the benefit of the 3-point line which came along long after his playing days. But the 56-point outing nearly didn’t happen. “There is no question it almost didn’t happen,” Rayl said matter-of-factly, explaining that he and Indiana head coach Branch McCracken, a two-time national champion at IU, did not quite see eye-to-eye during a workout and he decided he was done with practice. 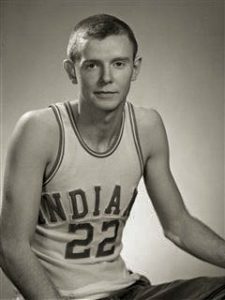 That Saturday – Feb. 23, 1963 – Rayl had 32 points by halftime in his second 56-point game of his Hoosier career. The first came against Minnesota in January 1962. This entry was posted in Basketball, IHSAA, Indiana, Kokomo. Bookmark the permalink.